When it comes to content marketing at Orbit Studios, we’re number crunchers. Data analysts. Metrics maniacs. We love writing too. See, we firmly believe to ace content marketing you have to study both math and language arts. We’ve seen some encouraging statistics this year about content marketing at large. 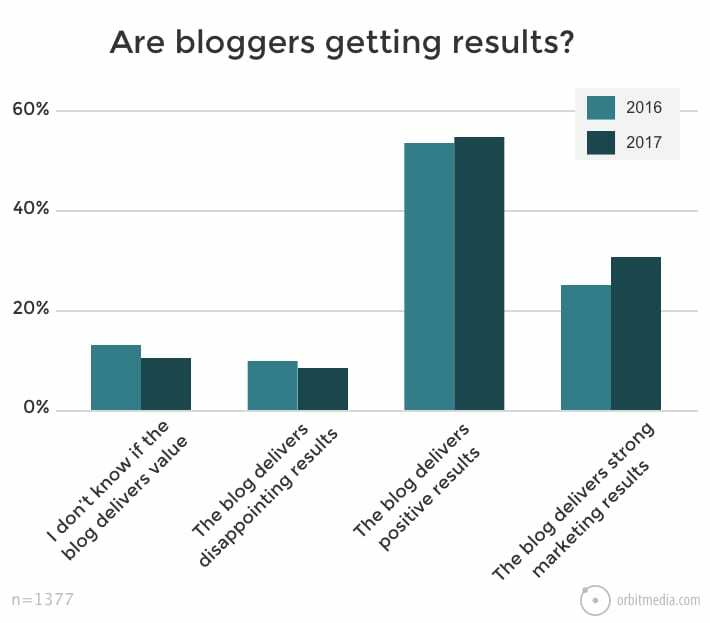 Our annual survey of business bloggers told us more bloggers are getting more positive and strong results from their efforts this year, compared to last. The two data points on the right side of this chart indicate a 20% increase in bloggers who report strong results. 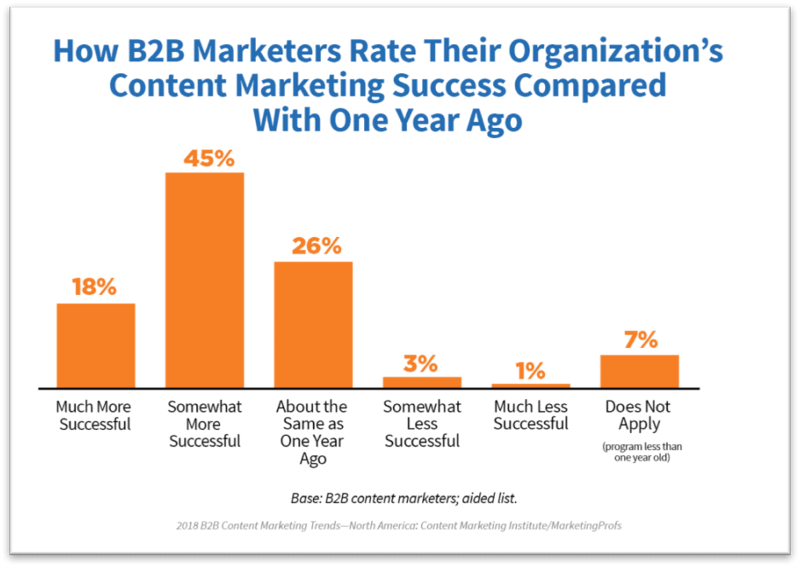 The annual B2B Content Marketing 2018: Benchmarks, Budgets, and Trends North America report indicates an impressive increase in B2B content marketers seeing improved success. In B2C marketing, this year’s survey respondents checked the “much more successful” box at an even higher rate. For journalism class, we thought we’d scour some of the best marketing blogs, study what leading experts are saying, and compose a story featuring their insights. Here you go my mathematically minded and linguistic loving friends: stats, equations, quotes, opinions, observations, suggestions and more from many of the finest professors in content marketing. “We all know that any company with a website is a ‘publisher,’ but only recently have we begun to understand what that really means. “A lot of marketing funnels out there aren’t suffering from bad writing; they’re suffering from the wrong type of content. As you’ve probably heard before, “For every job, there is a tool. “Develop a signature piece of content. When you produce an authoritative work on a topic in your industry, it is a major source of credibility for your firm. You are demonstrating what is the most important criteria potential clients look for in a new firm…expertise. Think of it as a short cut to the short list. “Content isn’t just for marketing anymore. Today, the content you leverage in your sales process might be even more important than the content in your marketing process. “According to Adobe, 40% of the average company’s revenue comes from current customers, yet just 2% of budget is spent on retention efforts. In 2017, smart content marketers will create more content for current customers, enhancing retention and triggering improved LTV and advocacy. “Data is more critical than ever because users increasingly expect highly relevant experiences. Amazon, Google, Netflix and other online services have trained users to expect speed and personalized experiences. This has trained users to expect these relevant experiences. 42% of bloggers are still not using email marketing—a tactic we rely on at Orbit. Meanwhile, there is almost a 5x increase in paid content promotion since 2014. In 2014, Mark Schaefer warned us about content shock. He made a clear case that content marketing is not a sustainable strategy for many businesses. In 2015, Steve Rayson of Buzzsumo crunched data from millions of posts and proved the majority of content earns very few shares and zero links. Despite these sobering slaps upside the heads of content marketers everywhere, significant studies from 2016 and 2017 reflect encouraging news regarding the results content marketers have experienced. What conclusion should you draw? Achieving success in content marketing requires creating GREAT content—content that’s more relevant and valuable to your prospects and more resourceful than what your competitors offer. Achieving success time after time requires following the advice above time after time. Finally, achieving success perpetually requires committing to being a student of marketing, a subject that’s evolved far more in the past decade than the entire century that preceded it. Create mind blowing content. Examine the results. And keep studying this stuff. Great post, Barry! To add on, marketing messages need to get more concise, clear and consistent. Too many web pages are too dense to extract a clear message from, even too hard for average people to read. Nice. Fun thing about roundup posts with comments sections below: they grow more informative when peeps like you contribute. Thank you George. Barry, BOTH you and Andy are truly great examples of content “quality” always trumping content “quantity”. I know you two guys don’t send me a ton of stuff, but when you do, it’s always powerful and I always make a point of reading it, start to finish. I think this may be the most important lesson of the post you’ve written, and what Neil Patel added above. SO MANY marketers focus more on the quantity… And when they do, they just start becoming the same ol’ noise that everyone has learned to tune out and not pay attention to. Thanks for your post. Thank you for the encouraging words, Jack! I completely agree. Consistent frequency is important, but quality rules! High praise. Thanks a million Jack. Thank God. This is essentially my pitch. Good writing comes before everything else. If there’s no reward in the reading itself, then your visitors will click out. And they should. I mean, come on: a blog is words! Get a qualified writer to put them there. The irony here is an illustration Andy gave me I’ve used to refocus my use of short but relevant content pieces at the Nov wine &…..